Crop rotation is one of the principle pillars on which conservation agriculture (CA) is based. The other two are minimal soil disturbance and maximum soil cover. The question now is: Why is crop rotation important? To explain this we will start at what do we imply with crop rotation. It is the practice of alternating different crops on the same field from year to year. The aim is to alternate crop types as much as possible. By alternating grain crops, like wheat, with broadleaf crops such as canola, lupin or a pasture crop like medics we have the opportunity to create diversity on a field. When looking at nature, a monoculture only occurs in very rare situations. Diversity is king and has well known benefits. One of the most important ones is that diversity above the soil impacts the biodiversity in the soil. Over the last five years the knowledge about the effect of the biodiversity in the soil has grown exponentially and we now know that this diversity plays an immense role in production. By bringing diversity into your cropping system you have the opportunity to break disease cycles that can become destructive if the same crop is produced every year. By including legume crops like lupin, vetch, peas and legume pastures you have the ability to fix nitrogen from the air for free. The nitrogen that is fixed by the legume plants will break down in the coming year and farmers can thus lower the amount of nitrogen fertiliser needed in the following crop, thus saving money. To explain the benefit of crop rotation in more practical terms we will have a look at the effect of crop rotation on wheat yields from the longterm crop rotation trial at Langgewens Research farm in the Swartland (Western Cape). Graph 1 shows the average yield in wheat following different crops in the trial. In graph 1, monoculture production is indicated by the wwww sequence. The average yield in the monoculture system, which serves as a control in this system, is 2 566 kg/ha. The data used to generate the graph was obtained over a 20 year period. When we break the monoculture practice by including a canola crop (1 in 4 years), the average yield of the wheat following the canola (cw sequence) increased by 600 kg/ha to 3 166 kg/ha. If you then plant wheat again for another two years, the average yield drops by 216 kg/ha in the second year of wheat (cww) and another 292 kg/ha in the third year (cwww) of wheat. Two possible reasons for the drop in production might be attributed to disease and weed pressure. If you keep producing the same crop year after year, weed pressure of grass weeds increase in the system because it is difficult fighting such weeds in a cash crop that is also a grass. 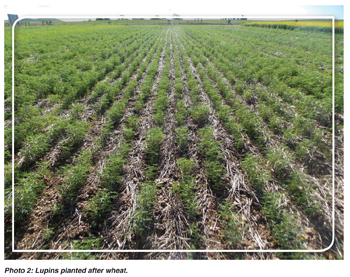 By including a legume crop the average yield increases even more. In the lw sequence wheat is planted following lupin and in the mw sequence, following medic pasture. The average yield of the wheat following lupin was 781 kg/ha more than in the monoculture and 944 kg/ha more following the medic pasture. The extra nitrogen in the system that was fixed by the legume crops and weed control contributed to this increase. By alternating a grass crop with a legume or a broadleaf crop like canola, you can control grass weed in those years lessening the competition with a grass cash crop. The last remaining sequence is where wheat is produced following canola (broadleaf crop) and medics (legume pasture). The average yield of wheat produced in this sequence was 856 kg/ha higher than the monoculture. It is a little lower than where wheat followed only medics, but it is because the canola also uses some of the fixed nitrogen. The benefit of this sequence is also attributed to extra nitrogen in the system and you have two opportunities to eliminate grass weeds, during the pasture and the canola crop. It is thus clear, from the data we discussed, that by implementing crop rotation into your production system, you benefit much more than by just producing a single crop type.